While you are hanging out on the Internet (in your underwear, maybe?) on a Saturday, kids that are smarter than either of us are out there getting ready to change the world. 18-year-old Eesha Khare (left), for instance, not only invented a supercapacitor that could someday be a phone battery that charges in just a couple of seconds; she also won $50,000 for it. 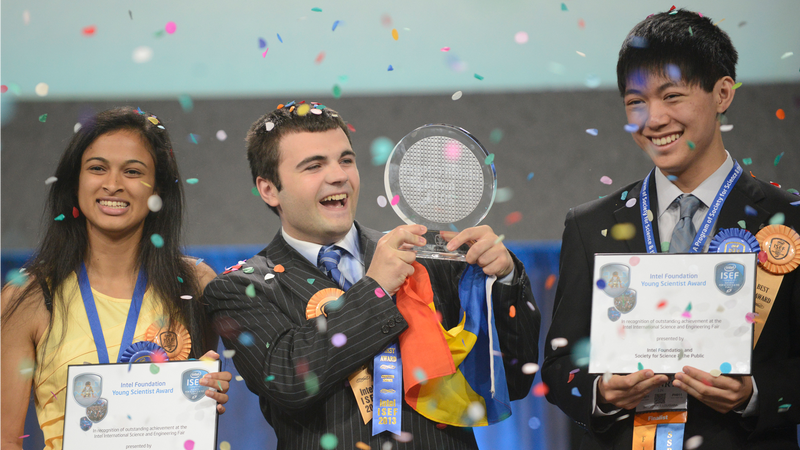 Khare is one of the three big winners from the Intel International Science and Engineering Fair. She and 17-year-old Henry Lin (right)—who created a model that simulates thousands of galaxies—picked up Intel Foundation Young Scientist Awards. Meanwhile, 19-year-old Ionut Budisteanu won the Gordon E. Moore Award and $75,000 for his AI model that could lead to a cheaper self-driving car. Khare's invention is the one with some really immediate potential though, and quick-charging phones is something we all want. So far, the supercapcitor has only been tested to light up a LED, but it was able to do that wonderfully and the prototypes new format holds potential to be scaled. It's also flexible and tiny, and should be able to handle 10,000 recharge cycles, more than normal batteries by a factor of 10.